Happened to pick up an apple from the floor that had fallen from an apple tree with very red apples. I was surprised to find the apple was red to the core. Never seen this before. Even more surprised to find someone spent 20 years developing a red apple variety which was announced in 2010 (result of 20 years of painstaking work by Markus Kobert, a Swiss fruit grower). He could have saved some time if he visited the Wirral! It has a slightly plummy taste too! How common are apples like this? How exciting! Do you own the tree? There is a tree on the property next to me that has a tree that produces that kind of apple...Not sure what kind of apple it is...Could be a wild tree..Apples are good eating..and great for apple sauce. You are the only other person i've heard of that has seen this kind of apple. I'm in Michigan, USA. There is an orchard within a half hour drive of my house that has multiple varieties of red fleshed apples. They make some awesome hard cider from the red fleshed apples. 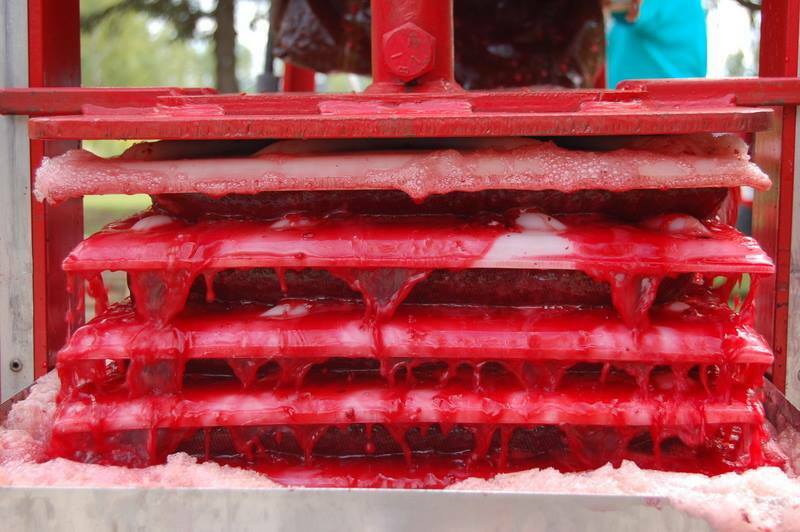 Check out this juice being pressed! Greyt.Chase wrote: I'm in Michigan, USA. There is an orchard within a half hour drive of my house that has multiple varieties of red fleshed apples. They make some awesome hard cider from the red fleshed apples. Check out this juice being pressed! Oh my god that looks amazing, reminds me of candy apples. Do you know what variety they use? Ill actually be in MI this weekend for a cousin's wedding...may have to check it out, if I'm close. The fellow who runs the website Skillcult is actively working on red fleshed apples. He has a number of youtube videos on the subject.